On Monday, Sept. 17, the Florida Panthers announced Derek MacKenzie would be relinquishing captain duties to Aleksander Barkov. The Panthers drafted Barkov second overall in 2013 and has centered the Panthers’ first line since Jaromir Jagr joined the team at the 2015 Trade Deadline. Barkov had a breakout season last year, notching 78 points in 79 games. At 23 years old, he becomes the 10th, and youngest, captain in Panthers history and second youngest in the league to Connor McDavid. This is the beginning of a transition to hand over the reins of the team to the young guns. After what felt like dozens of years of conditioning, it finally appears as though they can do the heavy lifting on and off the ice. The remainder of the Panthers’ leadership group for this season comes in the form of Aaron Ekblad, Jonathan Huberdeau, Vincent Trocheck, and Keith Yandle. Yandle is the veteran voice among this group, while the other three were all drafted by the Panthers as far back as 2011. Any one of these four could just as easily have been named captain, but it is Barky they all look up to. He is often the last player on the ice at the conclusion of practice and is widely regarded as one of the hardest working guys in the league. MacKenzie described his time as captain as a huge honor and was happy to pass it to someone as deserving as Barkov. Introducing your #FlaPanthers leadership group for the 2018-19 season. There was some discussion as to whether this was a role suited for Barkov, as he is a bit more reserved than some of his other teammates, but he has grown and shown through the years that he can handle the responsibility. His value to the team is hard to describe. Last season, his average time on ice among forwards was second only to Anze Kopitar, and by one second. He tends to require attention from the opposing team in all situations, as he dominates on both offense and defense, at even strength, and on the power play and penalty kill. It was obvious during Barkov’s short time with Jagr that Barkov wanted to be as dominant and as respected as Jagr was. With Jagr on his wing, Barkov developed, and today, parts of his game even resemble those of Jagr’s. During the latter part of Jagr’s career, he specialized in using his backside and stick to stave off defenders. When his feet started to slow down, puck protection and physical strength were what kept him effective. Puck protection and physical strength are also key parts of Barkov’s game, but unlike Jagr, his feet are just getting started. 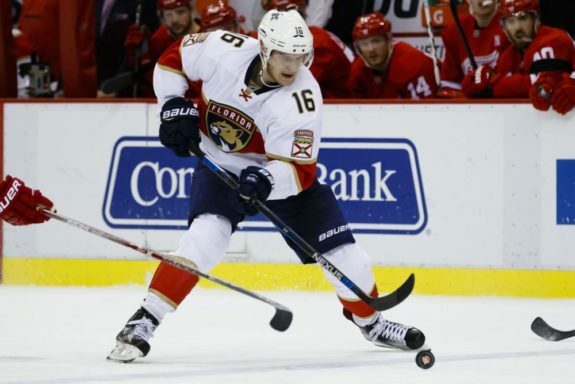 Since Barkov’s arrival, others who have held leadership positions with the Panthers include Ed Jovanovski, Willie Mitchell, and Shawn Thornton. These men, in addition to MacKenzie, have all enjoyed successful careers in hockey and understand what it means to be leaders in an NHL locker room. Thornton, former outspoken teammate and current Panthers employee, described joining the Panthers when Barkov was just getting started in the league. Thornton was an alternate captain and eventually asked to have his locker moved next to Barkov’s. “I wanted to get to know him as well as force him out of his shell a little bit,” he told George Richards of The Athletic on Sept. 17th, 2018. He said there are a lot of leadership qualities in Barkov that fans probably don’t see. MacKenzie surrendering his ‘C’ takes a lot of pressure off the Panthers to keep him in the lineup on a nightly basis. He is a 37-year-old veteran nearing the end of his career and it doesn’t take much to see that his feet aren’t what they used to be. This is not meant to become a MacKenzie roast, or an article that criticizes his leadership ability or on-ice performance. But, it wouldn’t be a good look for any team to healthy scratch their captain. MacKenzie is not necessarily a burden. He will remain a vocal and important part of the Panthers’ locker room, but the luxury of potentially having one more bottom-six forward spot available can’t be understated. The Panthers have a number of players who are probably more capable of producing at this point in their careers than MacKenzie. Young players like Denis Malgin, Maxim Mamin, and Henrik Borgstrom, among others, all deserve a chance to show what they can do.